…but today, my dearest love punched me in the nose. Really, really hard. From Mur Lafferty’s Twitter feed came a posting that made me go “Wow…just…wow.” Apple is celebrating Podcasting’s birthday with a celebratory banner (seen above), featuring many “trailblazers” of the medium. Very cool…until you note the birthday. Today, with me and a few others, a line was crossed. So for Steve Jobs and the folks at Apple, allow me — one of the authors of Podcasting for Dummies — to give you a brief history lesson. Many of those “few others” went omitted from the “Early Adopters” such as Mur Lafferty, Michael R. Mennenga, Evo Terra, Chuck Tomasi, Kreg Steppe, C.C. Chapman, Rob Walch, and Todd Cochrane. Podcast authors, including the early adopters such as myself, Mark Jeffrey, and Scott Sigler, went completely omitted. I recall launching into this uncharted territory in 2005 with no help from Apple in the ways of distribution, and still I managed to find listeners around the world. I remember tracing the steps and working on roadmaps for people to try and avoid the pitfalls. I remember Steve Jobs condescendingly referring to podcasting as “the Wayne’s World of Audio” right before announcing that iTunes would provide a directory. And I also remember when Apple made early adopters rewrite their RSS feeds in order to appear in said iTunes directory. 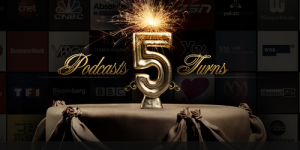 Still we managed through the up’s and down’s and the lack of a “real contact” at iTunes, particularly when it came to their “Show Approval” notices and rejections, and now, podcasting is rapidly approaching its birthday. We have now evolved into video, and there are still enhanced podcasts working their way through the podosphere. Some voices may have faded into the night, but more talent continues to appear on the iTunes Directory and share their thoughts with the world. I do agree that this is a time for celebration. And gifts. So for you, Apple, I come bearing the gift of knowledge. Now you know better. Happy birthday. In two months. History has been rewritten the Apple way…. It’s not a big deal…. Sent from Steve Jobs iPhone….. I remember that time quite well, Apple coming into Podcasting gave the Medium a good boost but it definitely wasn’t the birth! Thanks for the Highlight Tee. Just another move by Apple to make it seem like you need an iPod to podcast. Shameful. Always remember ipodderX! Shame on them! I was listening to nearly all of those early podcasts you mention way back in the day, too. Too bad nothing counts until Apple gets involved! AMAZING POST! I actually marked the appearance of the podcast directory in iTunes in my calendar – June 28, 2005. The exact day (planned, of course) with the first episode of my THIRD podcast property – Scrapcast.com (now defunct). I started podcasting in September 2004. Besides being early to the party, I was one of the first WOMEN (not *the* first) to take to the Internet airwaves. Signed to Podshow after a nice run of **six-digit** sponsorships I earned on my own for my properties. Trust me when I understand about being left out of ‘history’ – a lot of the early guys are friends and continue to be to this day. I don’t have as much as a Wikipedia entry. I’m not bitter, I’ve just resigned to the fact that history gets written by those with power and money, and that, is Steve Jobs. PS – I’m friends with Harold Gilchrist (we live not far from each other) and were part of the original New Jersey Podcast Association over five years ago. If ANYONE got overlooked in podcasting history, I’d say it was Harold. Super sweet guy. Great post! I remember discovering podcasts when I worked a mindless data entry job. After reading your post, I looked back to see when I started that job. It was Aug 2004. At the time, I thought I was out of step and had missed something that had been going on for a while :-). BTW, my first podcast was “The Video Game Show” and I won a copy of Katamari Damacy from them. SO! I’m out of touch here, but did you ever get your iPhone 4? Despite reverse engineering podcast history, the Steve has created some lovely things to listen to podcasts on… the glass back on the 4 still freaks me out though.